Sprout is made possible thanks to the generosity and invaluable support from our sponsors and partners! We would like to express our sincere thanks and appreciation to the following brands. There are two types of people in the world, those that love Ben & Jerry’s and those who have never tried it. From a renovated gas station in Burlington, Vermont, their journey began in 1978 with 2 guys and the ice cream business they built is as legendary as the ice cream is euphoric. Ben and Jerry's always believed in peace, love and fair-trade ice cream! Ben and Jerry’s voice is that of a lovable activist with a passion for justice and ice cream. Founder Auguste Escoffier (1846-1935) was an amazing man who contributed in many ways to improve the lives of those in the culinary industry. His efforts to encourage the development of his peers and followers drove the industry forward, forged newer, higher standards and changed the culinary landscape of the world. Today, the Association has more than 35,000 disciples internationally. e2i is the empowering network for individuals and companies seeking skills and solutions for growth. Since 2008, e2i has assisted more than 600,000 individuals through our career guidance, professional development, and job matching services. With an extensive network of partners, e2i offers hiring, training and productivity solutions to businesses. We are an initiative of the National Trades Union Congress (NTUC) to support nation-wide manpower and skills upgrading initiatives. For more information, please visit www.e2i.com.sg. Founded in 2004, HungryGoWhere is Singapore’s leading food and restaurant reservations portal with an average of 5 million pageviews and 1 million visitors a month. Guided by a vision to satisfy the cravings of Singaporeans, HungryGoWhere aims to fulfill the needs of merchants and food lovers at every step of the food discovery journey, whether it is the need to search for a restaurant, book a table or explore the latest food trends. Established as an institution of higher learning in 1992, Nanyang Polytechnic’s (NYP) seven academic schools offer quality education and training through more than 40 full-time diploma courses. NYP also has a full suite of continuing education (CET) options for lifelong learning, ranging from specialist and advanced diplomas, to SkillsFuture modules and courses. NYP’s Asian Culinary Institute and the Singapore Institute of Retail Studies are CET institutes set up in partnership with SkillsFuture Singapore (SSG) to champion and transform Singapore’s F&B and retail sectors respectively. A third NYP CET institute - the National Centre of Excellence for Workplace Learning – also set up in collaboration with SSG will spearhead the development of progressive workplace learning strategies and programmes for companies here. Through its strong network of industry connections, NYP empowers learners for work and life through relevant curricula and deep capabilities. NYP strives to be the innovative polytechnic, creating a nexus of future-ready learners, ready to take on new challenges and contribute to growth and sustainability. Nanyang Polytechnic is a recipient of Singapore’s top organisational and business excellence awards: the Singapore Quality Award, the Innovation Excellence Award and the People Excellence Award. And is best for salad dressings, stir-fries, cooking, roasting and bread dips. Visit www.premiumlocalproducts.com for more information. Australian Fruit Juice (S) Pte Ltd was incorporated in the year 1973 as a fruit juice manufacturer with the aim of providing quality fruit juices to institutions and hotel establishments in Singapore. Since its incorporation 40 years ago, AFJ has been recognised in the Singapore Food & Beverage business scene as a leader in the provision of quality beverage solutions. Australian Fruit Juices is the sole owner of the brand name Ripe. Through the active promotion of the brand over the last 43 years, AFJ has positioned itself as the market-leading manufacturer and supplier for quality fruit juices to all major F&B establishments in Singapore. VertiVegies is a Singaporean Indoor Vertical Farming Company that was established with a simple objective – to empower consumers with the choice of eating healthy and safe food. With the best in class technology, we have the capacity to solve your concerns around transparency, safety and security of the food your family consumes. Our Philosophy centres deeply around Sustainability, Research and Innovation, and the importance of creating products that put consumers and our planet first. We farm locally to preserve the goodness of the food that is consumed and our processes are designed to ensure that customers get their food merely hours from harvest. Register to receive the latest event details & stand a chance to win a Sprout goodie bag! Thank you! See you at Sprout 2019 on 11-12 May at Suntec Singapore Convention Centre, Hall 403. *The Organisers will be in touch with you via email if you are one of our lucky winners of our exclusive Sprout event goodie bag. Good luck! *By pre-registering for Sprout, you agree that the organiser may collect, use and share your personal data, as provided in this form to our event’s business partners to send information about selected products and services, including their latest promotions and products/services. To opt out, please inform us via email at sprout@suntecsingapore.com. 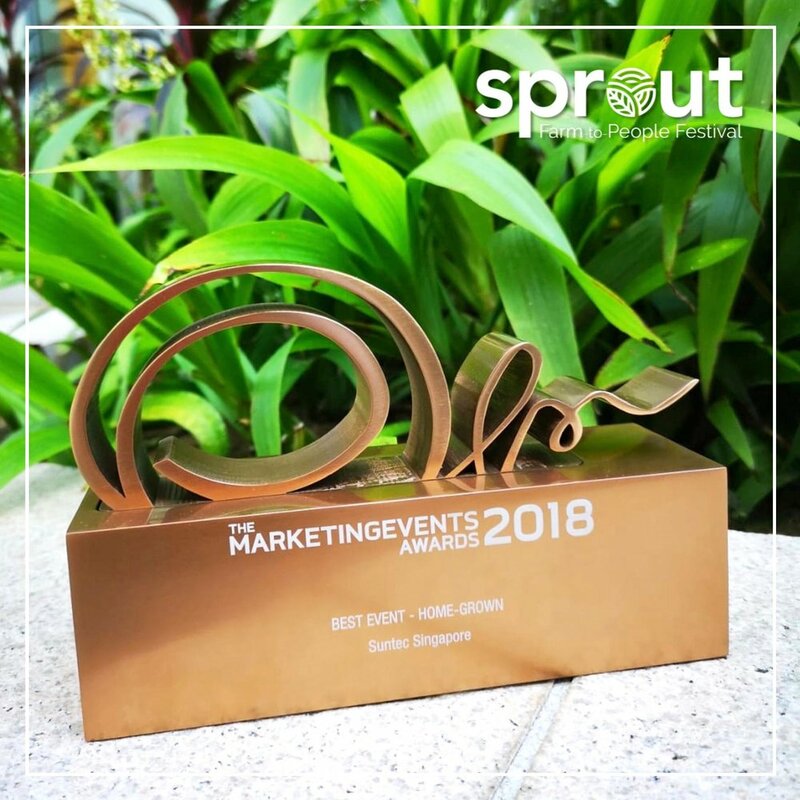 Sprout 2018 was awarded for Best Event (Home-Grown) for The Marketing Events Awards. Copyright © 2019 Sprout. All rights reserved.